I’ve been watching a lot of YouTube lately. Videos about healthy eating and such. A couple of those videos recommended making “Smoothie Bowls” for breakfast but I wasn’t completely sure what a Smooth Bowl was. So on a recent visit with my sister, Jessica, she showed me how it’s done. She rummaged through her freezer and refrigerator for ingredients she thought would go well together and away we went. The outcome was such a delight! I know you will love it too. Glad you asked! 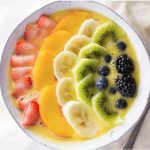 A Smoothie Bowl is basically a very thick, healthy smoothie which is poured into a bowl, crowned with an assortment of yummy toppings and then devoured with a spoon. 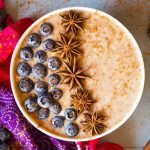 Below, you will find a list of the ingredients that Jessica used to create her Fruity Maple Smoothie Bowl. Below that, you’ll find inspiration for making your own Smoothie Bowl. There are so many different ingredient combinations that work well for this. Of course, the one staple ingredient I never leave out is the Pure Maple Syrup. Yum! 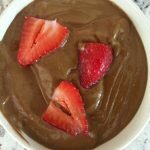 We encourage you to get creative with your Smoothie Bowls. Try using ingredients that you already have in your kitchen. There are many different ingredient combinations that work well together. Just make sure you add something frozen to create thickness and something liquid to help your blender blend. Of course, don’t forget the Pure Maple Syrup! Share your creations on our Facebook page! We can’t wait to see them.